Hello Linux Geeksters. As you may know, Ubuntu Mate Remix will most likely become an official Ubuntu flavor, starting with Ubuntu 14.10 Utopic Unicorn. 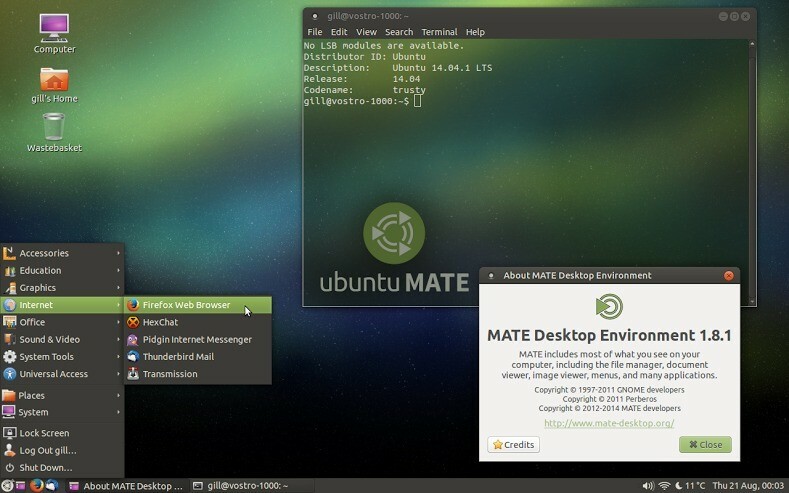 Ubuntu Mate is more than Mate running on an Ubuntu system, because it also provides special customizations for the system to match with the other Ubuntu official flavors. So, the first stable version of Ubuntu Mate will be Ubuntu Mate 14.10, scheduled for release on the 23rd of October, 2014, along with the other *Buntu systems. Also worth mentioning, Martin Wimpress, one of the leading Mate developers has managed to tweak his Ubuntu 14.04 system using Mate, to look like Windows XP, so that his mother get’s an easier accommodation with Linux. Due to the fact that Mate provides a lightweight desktop environment, it is quite recommended on old computers. This is not plain Mate 1.8.1, the two packages provide all the tweaks configurations and themes to match with the Ubuntu systems better. You should install the Mate desktop over Xubuntu, Ubuntu GNOME or Ubuntu Unity, because they are developed in GTK, the same as Mate (and not Qt, as KDE). I think you missed a step. yes, you are right. 🙂 i have fixed the instructions.